Are you fond of ornamental colored lighting? Perhaps your personal area at home is illuminated with a collection of novelty lighting fixtures and devices which make for awesome conversation pieces. If so, then you should consider getting a plasma lamp to complement your assortment of gleaming trinkets which are unconventional in a nice, curious way. Listed here are the top 15 plasma ball lamps on Amazon with their corresponding details of specifications and reviews. The Creative Motion Plasma Ball impressively functions like a charm in any dimly lit room. It makes a dazzling display of beautiful tendrils of uneven blue lines which stem from the electrode and end with a radiant color of pinkish orange. This plasma lamp is very motive and easily reacts to touch. The Creative Motion Plasma Ball can run continuously while it is plugged into any regular power outlet. On the other hand, it also provides another awesome feature which is the audio sensitive mode of operation or the sound activation mode of operation. The thunder sphere reacts to even the slightest sound. You can play your favorite songs on your computer or turn up the radio and watch the Creative Motion Plasma Ball flicker in sync with your music. The Creative Motion Plasma Ball is 11 inches in height including its wide black industrial-grade plastic base while the sphere itself is eight inches in diameter. It will definitely be money well-spent on the Creative Motion Plasma Ball. If you are looking to relive childhood memories spent in science museums or those moments at your earliest science classes when you were enthralled by thunder globes as a grade schooler, then you can buy the cool and neat Nebula Plasma Ball. This design and creation by brand manufacturer Unique Gadgets & Toys is truly a great manifestation of the timeless wonder that is the plasma sphere. At 12 inches in height inclusive of the wide and sturdy plastic base and with the eight-inch diameter of the glass sphere, the Nebula Plasma Ball is large enough to provide you with an amazing experience without being bulky. It is like having your own personal lightning bolts right at your fingertips. A piece of the Nebula Plasma Ball, or perhaps more, can make for crowd-pleasing props during a sci-fi-themed occasion or a science camp, for instance. Aside from continuous operation when turned on and lighting exhibitions when tapped, it is also has an audio switch selection which allows for the orb to attract and react to vibrations or sounds. Be wowed by the EDMBG Touch & Sound Nebula Ball with its motive red and pink sprites which are emitted bright and strong enough that there are no issues watching and enjoying it even during daytime. This eight inches wide lightning dome makes for an exciting year-round gift to children and adults alike. It is very well-constructed with a thick glass globe. The Touch & Sound Nebula Ball works through two methods. As its name suggests, it instantly and effectively responds to both the touch of your hands and to any surrounding sounds or vibrations. The gleaming red and pink flashes of lightning-like beams gracefully dance, form and swirl to music with a rhythmic and rather poetic flow. You can watch the Touch & Sound Nebula Ball in awe as it reflects your own talking voice as if it were responding to you in stunning light waves of crimson and scarlet, and rosy pink. The Touch & Sound Nebula Ball is certified by and listed under the American safety organization Underwriters Laboratories or UL. Operating on four AAA batteries or with the use of a USB port, the HDE Plasma Ball Lamp is a portable nebula sphere novelty toy which should look cool and can pep up any area where you wish to place it. It is conveniently small-sized at a little over four inches wide and over five inches in height. The HDE Plasma Ball Lamp can add flavor to your work area or creative space at home, or your office table. You can also shove it atop your books in a shelf smartening up the rack. This nebula sphere novelty toy radiates a number of exciting streamers including some soothing pinkish and bluish plasma which is sure to catch attention. It is a great idea to keep a few of these lightning orbs to artistically scatter around your room or you may choose to hand some over to your friends and the little ones in your family as a gift. Given the power source of the HDE Plasma Ball Lamp, it is definitely handy for adults who enjoy this kind of conversation piece and is safe for kids to play with. You may be an office professional who is a high-spirited kid at heart or a parent who wants to introduce your young one to the wonders of the physical sciences. Whichever may be the case, the mini Voilio Plasma Globe will certainly be a great choice of knick-knack or educational item. You can interact with it with your fingers and palms playfully poking at, tapping on and drumming around the plasma ball lamp. For your little ones, the Voilio Plasma Globe can be a beneficial, effective and at the same time a fun learning experience. It is also very convenient to be used in simple scientific demonstrations in class because it can either be powered with batteries alone or operated on USB port. At only 4.3 inches in diameter and six inches in height, the Voilio Plasma Globe gives off excellent color effects and has superior lighting capacities for any indoor environment. The magical Crystallove Decorative LED Plasma Light emanates cool and striking blue streamers which end with warm and cheery pink on the interior surface of the glass globe. You can control the motion of these lights with your hands scattering them across the sphere as you spread your fingers and gather them together as you close your hands into a fist. The Crystallove Decorative LED Plasma Light is a diminutive model of a thunder dome at only 3.5 inches in diameter. It is lodged on a translucent thermoplastic polymer base so you can see the mechanical components of the plasma lamp. This will be helpful for learning demonstrations for children. With the exceptionally bright emission of lights of such a small version of a plasma sphere and the convenience of using only batteries or a USB port to power it, purchasing a Crystallove Decorative LED Plasma Light will be like taking home with you, or anywhere at that, a wondrous piece of a science museum. The Flashmen Plasma Sphere Lamp is so convenient you can practically put it anywhere for display, even as nicely peculiar a place as the dashboard of your car. It is lightweight and suitably small. It can be powered with four AAA batteries or with a connection to a USB port of your computer or tablet. 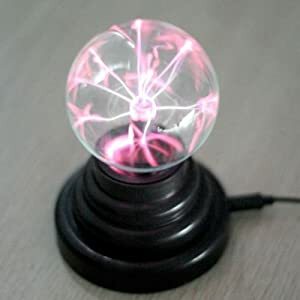 In addition, the Flashmen Plasma Sphere Lamp can also make for an awesome tool for teaching electric power and the energies that fuse to create plasma, or a decorative trinket for sheer spectacle and plain entertainment at home or at work. This version of the lightning orb is truly mystifying as it releases sparkling and colorful plasma lights while you twiddle your hands over and around it. As well, this tiny dome of marvels can resonate your voice or the music playing in the background by way of sending out plasma lights as it captures sounds and reacts to the beat. The Rock Your Room Electric Plasma Lamp is cool and geeky at the same time. Its glimmering waves of light are both fun and intriguing, making you think of what kind of technical mechanisms is making the the illuminating motion. This model of the plasma ball lamp certainly lives up to its name as it can rock any room where you place it in adding zest to a dull corner, shelf or side table. The Rock Your Room Electric Plasma Lamp can be activated with both touch and sound. These features make it a nice diversion and stress-reliever to have as you randomly move your hands around it or as you listen to your favorite music on some lazy afternoon. The dimensions of Rock Your Room Electric Plasma Lamp make it very handy at four inches in width and six inches in height including the base. You can choose to acquire several of these mini thunder domes because they are sure to make perfect ornaments for your home, office desk or for small gatherings. 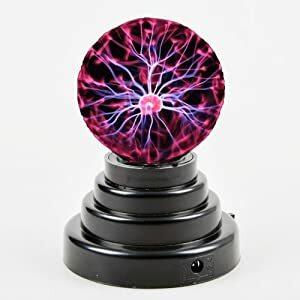 The SOLMORE Plasma Ball Light is truly magical as it boasts of a wondrous blend of neon gases whose molecules and atoms clash with the electrons given off by the Tesla coil to create amazing bluish purple and fuzzy pink whirls of groovy plasma lights. You can entertain yourself while making imaginary doodles on the crystal globe and watch in amazement as the electricity follows your hand movements as exhibited by the bolts of shining lights. At eight inches in diameter, the SOLMORE Plasma Ball Light can be turned into a centerpiece of your home without being distracting. Instead it will be an arresting novelty item which will not fail to amuse with the soothing impression of its beautifully uneven lightning-like rays. The SOLMORE Plasma Ball Light is powered through connection to a USB port on a computer, power adapter or tablet. Keep yourself mesmerized and get your own piece of SOLMORE Plasma Ball Light. It will also make for a trendy and stylish gift to your friends or family. At first glance, you will instantly be drawn to the KssFire Mini Plasma Sphere Lamp. You can try collecting a bunch of these miniature lightning orbs to spruce up the interior of your house. You can also use them during parties. If you own a shop such as a cafeteria or a store, you can use a number of KssFire Mini Plasma Sphere Lamps to embellish your commercial space. They can turn your business space’s already glamorous look and feel into an even more inviting and relaxing ambience. If you are an artist and are awaiting your first painting exhibit, sprinkle your exhibition area with these little thunder domes designed and created by KssFire. Undoubtedly, there are so many things you can do with the KssFire Mini Plasma Sphere Lamps as there are so many places where they are perfectly suited. The KssFire Mini Plasma Sphere Lamp can be powered by four AAA batteries or through connecting with a USB port or any fitting power adapter. The BDwing Magic Plasma Ball Lamp is a little thunder dome of a curious mix of mystery that is enchantment and the exquisiteness that is science. It is a nice attraction and an interactive entertainment item truly enjoyable with a stunningly gorgeous glow of multiple colors of plasma streamers prancing from the electric conductor outward onto the interior surface of the glass orb. The BDwing Magic Plasma Ball Lamp is pleasantly versatile with its mini size, whose diameter measures only three inches and whose height is a little above five inches. You can display it in just about any area at home, in your bedroom, or even at your individual work space. In addition to this convenience, this delightful nebula sphere novelty toy can function on four AAA batteries. If you are not planning on moving it around and transferring it every now and then, then your other very accessible option is plugging it into a USB port on your computer, or any other device or adapter. The LORIZA® Large Nebula Plasma Ball is a unique and tasteful embellishment to spice up any room. This version of the plasma ball lamp, designed and created by LORIZA®, brings fun and excitement to a housewarming party with your friends or inspire many insightful questions from your young ones. The LORIZA® Large Nebula Plasma Ball is of outstanding quality. It provides hassle-free operation, with its plug and play feature, which offers no difficulties at all. This plasma sphere of eight-inch diameter is sensitive to, and can be activated with, touch and sounds. Of course, you can just set it out and leave it in a corner of your room and let the gases and electric current inside the globe do the trick of sending out jagged lines of lightning-like beams. This is why the LORIZA® Large Nebula Plasma Ball is very pleasant to have around as you relax while watching the colorful plasma streamers through the clear plasma crystal glass. The New Magic Plasma Light Sphere is very attractive as the plasma ball sits on a sturdy black base which complements the clear crystal filled with neon lights. It measures only four inches in diameter and six inches in height together with the foot stand. This makes the New Magic Plasma Light Sphere a convenient interior décor which is rather easy to move and transfer. This charming frill makes a variety of warm and fuzzy hues spring to life inside its tiny crystal dome full of electric charges clashing with gaseous elements to produce heavily colored plasma. The purplish white shafts of light emanating from the New Magic Plasma Light Sphere make it even extra special because these hues are rarely utilized in thunder globes. In addition, functioning via connecting to a USB port on a computer or other gizmos and power adapters, the New Magic Plasma Light Sphere also boasts energy efficiency. This eight-inch wide Nebula Plasma Lamp by LORIZA® will make the perfect party light especially as its plasma streamers can frolic along with your hip and upbeat club music because the one-off lamp can be switched to activate its sensitivity to sounds, voices and even clapping of the hands. You can surround a room intended to accommodate a small occasion with a few LORIZA® Large Nebula Plasma Lamps. They will not disappoint and can even exceed your expectations with the way they function. The LORIZA® Large Nebula Plasma Lamp can also be a gift ideal for anyone whom you know has a liking for collecting novelty items. This version of the lighting orb by LORIZA® will not fail to surprise and make your recipient thrilled with it. It can also be an excellent learning device for young kids through which their interest in the sciences can be roused at an early stage and which can keep them engrossed in the process. A pretty, downsized plasma ball lamp, the Disco Fever Plasma Light is lightweight and handy at only a bit more than four inches in diameter. It is lodged on a high-grade acrylic plastic base which makes the entire decorative item stand at nine inches high. Despite this miniature size, the Disco Fever Plasma Light certainly does not sacrifice durability. The plasma crystal ball itself is firmly thick. The Disco Fever Plasma Light can be your go-to stress-buster. You can choose to watch the little thunder dome make ripples of pastel-colored lights or you may fondly manipulate the motions of these lights as you run your hands over the glass globe. It is sure to put a smile on your face at any time of the day. The Disco Fever Plasma Light is also a real space-saver. You can set it on any space available in your bedroom or even at your rather narrow work desk in order to smarten up the area. The Systematic Composition of a Plasma Lamp: What Makes It Up? The plasma lamp is also referred to as the plasma ball, lightning sphere or orb, or thunder dome or globe. It is a sealed transparent glass ball filled with one low pressure noble gas or a specific, i.e., science-based and non-preferential, mixture of these inert gases. At the center of the plasma lamp is a high-voltage electrode which, when supplied with electricity, makes plasma fibers or threads extend from it to the glass. These plasma fibers or threads are the visible, intriguing streams of light which stretch to where you place your hands or poke your fingers on the surface of the plasma sphere. The designer and the discoverer. While it was MIT (Massachusetts Institute of Technology) student Bill Parker who is credited to have designed the first plasma ball lamp back in the 1970s, it was Serbian-American inventor and physicist Nikola Tesla who discovered the effects of plasma when enclosed in a globe as he was carrying out experiments with high-frequency electricity confined and limited in a void glass tube. Tesla named it then the inert gas discharge tube. He is also the reason why the high-voltage electrode sitting amid the plasma globe is at times dubbed the Tesla coil. The uses of the plasma ball lamps. For the most part, plasma ball lamps are used as curiosities. They are also known to create unique lighting effects in a room spent, say, for a space-age-themed party. You also see plasma ball lamps in movies being used as props for special effects particularly denoting exotic and extraterrestrial elements and aspects in the story. For educational purposes, the plasma ball lamps are used in the physical sciences to explain and demonstrate the various features and characteristics of electric currents as they set plasma in discernible, near tangible, motion. These days, the plasma ball lamps can also be purchased at novelty shops as decorative items for indoor use. Basically, plasma, the fourth state of matter, is composed of ions instead of molecules which, on the other hand, makeup solids, liquids and gases. The electrode and the ionization. Inside a plasma lamp, what happens is the electrons leave the electrode and then move toward the outside atmosphere and into an unstable electromagnetic field caused by the electrode itself. This travel is necessary in order to ionize the electrons and in turn, generate plasma. The process involves the collision of the electrons with the atoms or molecules of the noble or inert, i.e., non-reactive, gases contained in a plasma ball lamp. This travel is necessary in order to ionize the electrons and in turn, generate plasma. The process involves the collision of the electrons with the atoms or molecules of the noble or inert, i.e., non-reactive, gases contained in a plasma ball lamp. As mentioned in one of the previous sections, the noble or inert gases which are utilized in order to produce plasma in a lightning orb are non-reactive and low voltage. Their combinations, when trying to create the different effects and colors of lights, are not based on what you wish to be used in the plasma ball lamps but instead they have been carefully studied and experimented on. What noble gas fits which inert gas in order to generate plasma and safely produce energies and lighting effects? For instance, these days, many plasma ball lamps contain krypton or xenon. Some of them contain a mixture of either krypton or xenon with neon. This combination is not just out of impulse or whim. Krypton and xenon have properties which enable them to perfectly interact with neon. Now, let us take a look at the colors effected and emitted by each of the noble or inert gases used in a plasma lamp. Helium. Frequently obtained from balloons and known to have much smaller molecules than the other inert gases, helium produces a very vibrant display of bluish-purple. Neon. Neon produces the brightest display of colors ranging from red to orange to pink. Neon can be mixed with other noble gases except for helium. Once it is combined with another gas, the latter dominates neon which in effect, yields to the orange or pink glow at the end of the fuzzy current of light from the electrode. The commercial plasma ball lamp which you may plan to purchase most likely contains neon which is the more popular inert gas used in lightning orbs being sold on the market. This is because neon can be easily obtained from manufacturers and then again, it makes the most luminous arcs of lightning. Xenon. Xenon only makes a dim display of bluish gray, purplish gray or bluish white beams of light. Krypton. Krypton makes even dimmer lightning-like white shafts of light than xenon does. Depending on the background lighting, krypton, at times, produces some pale greenish-blue tint or a trace of purplish-pink shimmer. It is reputed to be expensive as it is hard to obtain. Argon. Pure argon makes flashes of light which vary from purple to blue to lavender. The sample combinations: argon and nitrogen. The mixture of argon and nitrogen in a plasma globe makes pinkish white or grayish orange streamers. At the end of the streamers on the inside surface of the glass are the colors purple, blue or lavender. A plasma lamp of argon and nitrogen is usually less expensive than the rest. The sample combinations: argon and neon. When argon and neon are mixed in a plasma ball lamp, they will require the lowest voltage than any other gases will. This low pressure requirement of argon and neon can allow for enough ionization within the globe, although the quality of lighting may not be as good as the other gases such as neon, used alone in a plasma lamp. 2 The Systematic Composition of a Plasma Lamp: What Makes It Up? Connect his frequencies USING A FREQ APP to generate plasma tube waves. Thanks for letting us and our readers in on that.